This is a review of the supplement Bio Terra Herbs Mental Focus…huh? This supplement claims to boost mental clarity. It also supports concentration. Read on to learn more about this product. Jujube seeds- contains many ingredients that can treat different diseases, strengthens the immune system and lowers blood pressure. It also treats insomnia and anxiety. Asian Ginseng- has several mental functions including improving abstract thinking, reaction time, and arithmetic abilities. It also reduces blood pressure. Poria (sclerotium)- used to treat memory loss, anxiety, fatigue, nervousness, and tension among other health conditions. Polygala root- creates a sense of calmness. It combats restlessness, insomnia, memory loss, forgetfulness, and inability to focus. Grass-leaf Sweetflag- acts as a stimulant and calming medicine. It can improve your overall well-being and treat several disorders. Astragalus root- benefits the cardiovascular system and the immune system. Also stimulates the circulatory system and treats nervous conditions. The suggested dosage is two capsules once in a day. They should be taken after a meal. One bottle lasts for 30 days because each bottle contains 60 capsules. There is no reliable information about the possible side effects. The absence of this information may be a significant concern for consumers who are allergic or sensitive to some ingredients. The price of one bottle containing 60 vegetarian capsules is $19.99 on the official website. However, you can purchase the product at a price of $18.99 from different online stores including Walmart.com and Drugstore.com. Shipping costs are applicable to all purchases below $50. In general, this product is cheap compared to most products in the market. Therefore, some consumers may question the quality of the product based on low pricing. We were unable to find a money-back guarantee for this product. The lack of a guarantee may prompt quality issues among potential customers who have not tried the product. We found a number of positive customer reviews. The testimonials posted on the official website show that the product has assisted users by improving memory, focus, mental resilience, and calmness. These testimonials give potential customers a reason to try the product. Mental Focus…huh? is probably a suitable product for improving mental clarity and concentration for several reasons. It uses a combination of natural ingredients meaning that users should not worry about their safety. These ingredients can be trusted based on what they can accomplish. Additionally, the manufacturer provides clear dosage instructions and offers the product at an affordable price. Some consumers have also given positive feedbacks. However, several drawbacks have emerged during this review. First, there is no clear information about the concentration of each ingredient, which makes it difficult to ascertain whether the prescribed dosage is reasonable. Moreover, there is no satisfaction guarantee or any evidence of GMP certification. 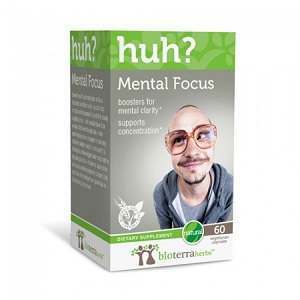 Henry Costa	reviewed Bio Terra Herbs Mental Focus…huh? on June 30th	 and gave it a rating of 2.5.